It's clearly time to revive the blasphemy laws, many of which are still on the books. Now, here's the interesting thing about Twitter's rules and policies. According to their own policies, they should start banning their own employees for abusive behavior in their attempt to silence Alex Jones. They say they're opposed to silencing someone else's 'voice'. Yet that's all Twitter does and explicitly says it intends to do: silence those who don't agree with its agenda for 'diversity'. "To better police off platform behaviour." This is starting to look like an equivalent to China's Social Credit nightmare. Orwell smiles knowingly in his coffin. If a real businessman were CEO of Twitter, the employees voicing their "unhappiness" with Twitter's policies of not kicking enough people off the site would be looking for new jobs by next morning...Dorsey must be getting major subsidies, based on his complete lack of interest in making money. I had wondered why twatter were the holdouts in this instance. Was it purely so theh could make it public it was demanded by their employees so they had no real choice? Personally, I am more anxious about this new trend of banning someone for something they may have said or wrote elsewhere. Every website has their own rules and everyone is required to follow the rules (as best they understand them) and those who ignore the rules may be banned completely and forever. But I never saw a user agreement that said their rules applied even to comments made on other websites or off the internet altogether. This is a disturbing trend. It says you must conform to their agenda everywhere (24/7) and not just when using their service. This amounts to the choice between slavery or banishment. OT but I need to ask.Do you think that Blogger would be converged? another website cesspit, Reddit, has had that trend appear about six months ago. They'll scour your subs and if you, gasp, subscribe to The_Donald, well, it's ban time for ya. Very clever. Very clever indeed. YouTube is owned by Google, so shouldn't this be the big G instead? Lol. nswhorse wrote:I had wondered why twatter were the holdouts in this instance. Was it purely so theh could make it public it was demanded by their employees so they had no real choice? Why in the world would any enterprise allow its employees to dictate its policies? Aren't the employees supposed to carry out the policies the board sets forth? Letting employees dictate company policy is just the corporate version of democracy. Was bound to happen eventually. YouTube is owned by Google, so shouldn't this be the big G instead? No. Alex Jones is not banned by Google. >>Why in the world would any enterprise allow its employees to dictate its policies? My take is that it is an assigning of blame. He doesn't want to take personal responsibility. And in general, statements of motive are not reliable. I find your proposal to rescusitate blasphemy laws very interesting. 1) How would these stop the social media companies from implementing their ban hammers? 2) Who's in charge of enforcing those laws? Britian is already doing it but in favour of that blasphemous abomination that is sharia. So what public authourity is reliable to enforce such laws? Vox, if you want the US to revive blasphemy laws, move back to the US. Very clever. Very clever indeed. YouTube is owned by Google, so shouldn't this be the big G instead? It may not be obvious but Vox is trying to make a distinction between Google and Youtube. There's lots of people at Google, especially in the (tiny) money-making parts, that aren't so converged and could use some backup. I dropped the, "LOL," from your quote for you as a favour. They shall be fined under this title or imprisoned not more than ten years, or both..."
Time for Trump to do his job and faithfully execute the laws. "It's clearly time to revive the blasphemy laws, many of which are still on the books." To clarify the above question, are you simply comparing Liberal ban policies to blasphemy law or do you suggest implementing blasphemy law in retaliation? Daniel Babylon wrote:"It's clearly time to revive the blasphemy laws, many of which are still on the books." If the blasphemy laws are on the books, then people are actually committing a crime when they blaspheme. It mirrors what the SJWs are doing when they use Code of Conducts and other rules to ban Right-wing speech. They ban the Right, we get them fined and imprisoned or whatever the law allows. SJW controls on speech are really blasphemy laws, with their religion being PC globalism. The difference being that God really should not be blasphemed, and we'd actually be doing them a favor protecting them from their own tongues. SirHamster wrote:If the blasphemy laws are on the books, then people are actually committing a crime when they blaspheme. You just blew my mind. So every atheist in the U.S. is liable to prosecution? @9, Yeah, it's common now for arguments on reddit to quickly turn to, "I see you comment on r/The_Donald, so your argument is invalid." Especially in Code of Conduct discussions or anything remotely political, but it probably happens in arguments over favorite breakfast cereal too. Leading assumption from the YouTube Talking Heads is that Dorsey wanted revenge on Jones for suing him for shadowbanning, so he asked Zuck and friends to wipe InfoWars digital footprint everywhere else, leaving him with hands oestensibly clean in purging Jones and holding power over him as his last off-site business-line. If this is the case, he failed to account for the myopic piranhas in his middle-management team twisting his wrists to make him dirty himself alongside the others and destroying the purpose of the whole episode. Whatever Jack does now will incriminate him, and he has only his pettiness to blame. Yeah, blaming the employees sounds like misdirection. Jack's under a lot more external than internal pressure. He's the only goy head of any of the companies in question. If he doesn't follow the plan, Twitter gets attacked in the media, financing dries up, and he loses the chance for a big buyout. Remember when Disney was planning to buy out Twitter last year, but backed out? The carrot and the stick. He can't say that, of course. Better to blame (anonymous) "employees." Remember last fall when a "rogue employee" deleted realDonaldTrump for 11 minutes? Those pesky employees. That would require a functional DoJ. So would stopping the Dems from stealing the election in Ohio. I'm not holding my breath. Daniel Babylon wrote:You just blew my mind. So every atheist in the U.S. is liable to prosecution? I take it you're not American? It isn't for the whole nation. US does not have national blasphemy laws, so it depends on state and county what is penalized. It's also not about the faith of the speaker, it's the content of the public speech. I wouldn't be surprised to find quite a few Christians/Churchians found guilty of blasphemy if enforced. Atheists who keep blasphemous opinions to themselves wouldn't be guilty of blasphemy. There was talk at the beginning of the year of moving regulation of social media from Federal Trade Commission to Federal Communication Commission to fix some of these things. And the Seth Rich info was supposed to be made public in June. "You just blew my mind. So every atheist in the U.S. is liable to prosecution?" And, every middle schooler and high school student in my town. I actually feel a bit sorry for @jack. He's clearly never wanted this job. He's still CEO at Square (the other company he helped found) which isn't making any profit, but he was all but forced into taking the Twitter CEO position again. You can also tell he's miserable there, as any time he shows up on camera he can't hide it on his face. The "Why?" is important. Twitter was the lynchpin of the Arab Spring, which was the Globalist move to install Muslim Brotherhood governments in the Arab regions of Africa. Twitter has been relevant to most revolutionary groups since then, thus the Deep State needs it around (especially as they don't have any replacement platform in the pipeline). Someone has to try to make the place work, and @jack clearly drew the short straw. Doesn't absolve him of his actions, especially not firing everyone, on the spot, that was having so many problems with their lack of action to remove Jones, but it makes his actions pretty predictable. He keeps getting drug all over the place because he'd love to be fired. He might be a Twitter co-founder, but he also clearly wants to be free of the Control Network he's had to deal with. He didn't realize he made a deal with the Devil when they did their funding rounds, but he can't get out now. He'll always go along, but Twitter always ends up being late to the show in the process. Thus, expect more "bumbling about" from Twitter. Jack might just screw up enough to get removed from the utterly unwinnable position he finds himself in. 1. How do you stop social media banhammers?. 2. Who is in charge of enforcement? 2. The established religion. For the woke left, that is the rainbow tolerant faith. This is already a religious war. It was always a religious war. The Enlightenment just invented a way to hide it, such that they managed to avoid the executions they rightly deserved. The enlightenment was a reaction to a religious war. And like a lot of reactions, not entirely wholesome. I actually feel a bit sorry for @jack. He's clearly never wanted this job. Unless he is being blackmailed, he could quit anytime. Or he found himself in the Hotel California? Lazarus wrote:I actually feel a bit sorry for @jack. He's clearly never wanted this job. Look at any recent pictures of him. He found himself in the penthouse of Hotel California. He went back into the full time CEO of Twitter in July 2015, permanent as of Oct 2015. Look for any pictures after that date. Then find any of them from November 8th, 2016 onward. Jack & Zuck are clearly taking the blame from the Elites for allowing Trump to happen. That has a great picture of him from a Oct 2017 story. He always looks like that. His eyes are going dead, but not in the drugged out way. Vox probably has some insight, from the Psykosonik days, about being in that place. I'm sure a few others do as well. AJ said it's because Congress is watching them at the moment. And all it took to drive the big tech leftists this crazy was for Alex Jones to call some gun control shills crisis actors. That has to be one of the best rhetorical killshots of all time. Well, if a nation makes it illegal to give Alex Jones a platform, then you better obey it. We wouldn't want to be anti-nationalistic now would we? Ominous Cowherd wrote:Why in the world would any enterprise allow its employees to dictate its policies? I perceive these corporate executives and university administrators as aging front-row kids getting a proxy hit of that sweet self-righteousness high, making up for all the social justice activism that they missed out on back in the day. They've always needed to maintain a relatively bland, inoffensive image, to maximize the ease and range of their future relationship management (which gets called "office politics" by people that aren't any good at it). But they always envied the free spirit (as they saw it) of the activists, so now they practically trip over their own feet stampeding to borrow some cool as the amenable authority. It's as pathetic as a grown woman getting insecure because a couple of tween twits are looking at her sweater and whispering and giggling, except even worse, because for the analogy to hold she would then have to pretend that her immature social cowardice is a sign of moral superiority. Absolutely contemptible from start to finish. 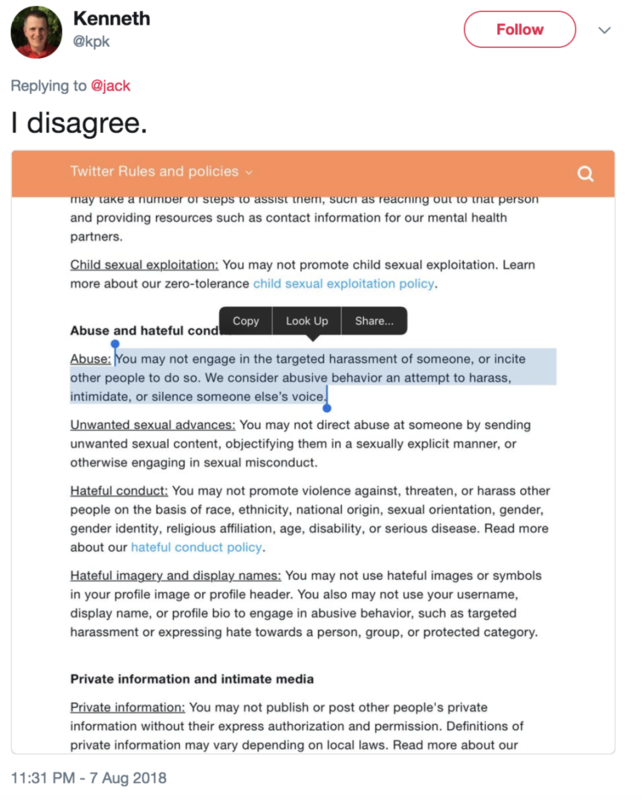 "Twitter’s current policies, which he said need to “evolve.”"
He's going to randomly change randomly selected parts of their policies and let nature sort it out? >>Jack & Zuck are clearly taking the blame from the Elites for allowing Trump to happen. That is what I have been thinking. These companies are the unofficial, official enforcement of PC correctness on the Internet. The mainstream media can be pushed around more easily than social media users. Thus the problem. @42, Brian, let me help you: Silicon Valley is not a nation. I never really looked at Dorsey before, but now I have to say, he looks weird. Not objectively unattractive but... repellant. Idk. Why in the world would any enterprise allow its employees to dictate its policies? These hip young tech companies "empower" their employees with a lot of nonsense. Their hiring pitch is, "Hey, come hang with our cool team! You can bring your pet, dress as freaky as you want, and even tell us what pronouns to use when we talk to you!" The owner is just @jack or whoever, so it's all very democratic. No surprise they feel like they're supposed to have a say in policy. You're retarded. You really shouldn't comment here. Or, for that matter, have children. so all the poor little guys can't help destroying the public square because they are slaves to their employees..must be hard for them. Man, the quality of trolls took a major dip when this Brian Dean character showed up. Soros' bench must be getting thin if that's the best he can send here. Resident Moron™ wrote:"Twitter’s current policies, which he said need to “evolve.”"
So he's admitting a lack of intelligent design? I was recently run off of Twitter for saying that Hillery should be charge, tried, sentence, and punished for her Treason and other, even more vile crimes. Apparently that's now "threatening language." They say they'll turn the account back on if I retract the posting. I went the "resolve disputes" route, and told them I was exercising my free speech rights, and that they have set themselves up as a public accomodation, no different from a lunch counter or a hotel, and are thus specifically prohibited from discriminating on the basis of creed. They sent back a snarky answer. I sent another message -- I'm a 27 year military veteran with multiple combat tours. The Trump Administration AND CONGRESS is NOT taking kindly to your 3rd world censorship practices being exercised by your foreign-born, H1-Bs who don't understand the principle of free speech, or any other commonly understood American value. Restore the account immediately, before the wrath of the government is upon you. I sent one last message: "As you wish. I have given you every opportunity to be reasonable. The pain is already scheduled for delivery. Just remember, when it's all done and over with: I will win, and YOU will lose. You're already in a legal trap that you cannot evade. "What a topsy turvy world we live in, that losing money to purge unwelcome customers and satisfy utopian visions is more important than having a functioning business"
That's what happens when your CEO and founder serves, first and foremost, the Prince of Lies. "I never really looked at Dorsey before, but now I have to say, he looks weird. Not objectively unattractive but... repellant. Idk." He's a soy-boy with phony-toughguy beard. A very rare soyboy who is actually intelligent enough to learn programming, but still a soyboy. Well just damn... 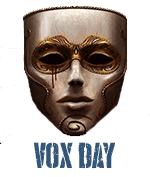 I hope.that they do not recognize #VoxDay as hate speech. Probably should drop account anyway, but it is a good way to spread truth until truth becomes the wicked. Somewhere, in your sad little pea brain, that sounded really brilliant, didn't it? "Well, if a nation makes it illegal to give Alex Jones a platform, then you better obey it. We wouldn't want to be anti-nationalistic now would we?" 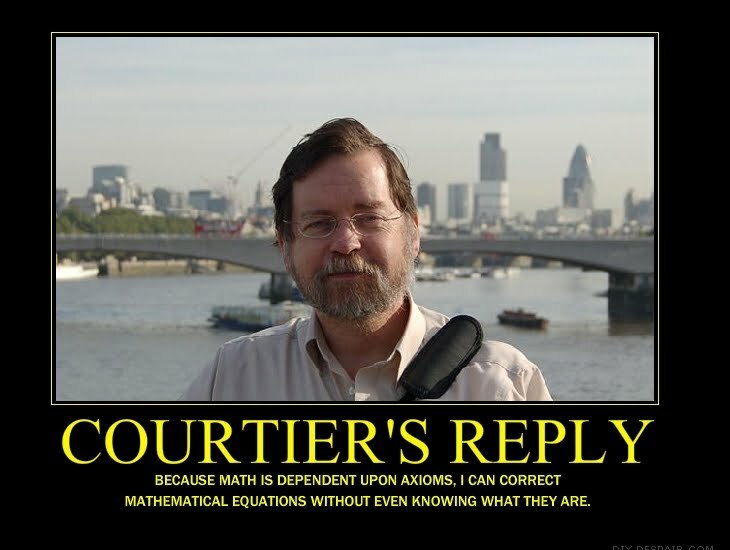 Aren't you the guy who said that if nationalism exists, that 2+2=4 can't possibly be true for both an American and a Cambodian? Aren't you also the lunatic who said that you lived in Saudi Arabia for more than the trifling 2 months that you were there, you would convert to Islam, out of convenience (in defiance of truth). Exactly what mind-debilitating drugs are you taking? Or were you born this stupid? "How funny it is how times change. I recall a left winger like Jello Biafra used to rail against the idea that censorship leads ultimately to the cries to Ban Everything! "